Just wanted to let you know we have fabulous prices all week on all Bernina machines through Monday, June 21. Want a 440QE classroom machine from the show? Special prices on them also. 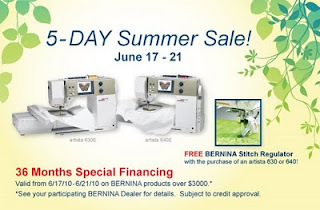 Isacord thread, stabilzers, and Bernina accessories are also on sale. We have blow-out pricing on the activa 230 Patchwork Edition- 1 left and on the activa 240- 5 left. Hurry in so you can get sewing on that new project! Special financing available too! Stop in and see Laurel, Anne, or Barb. 651-429-6500.